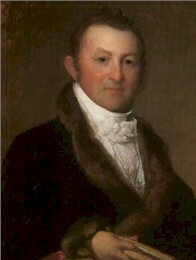 The nephew of revolutionary orator James Otis, Harrison Gray Otis served in the US Congress. He was speaker of the Massachusetts House, and President of the State Senate, ending his career of public service as the third Mayor of Boston. Perhaps most importantly though, he served on the legislative committee to select a site for the new State House. Boston was determined to remain the capitol, and appointed Otis to a town committee to purchase land and donate it to the State. By taking part in site selection, and purchasing the land, Otis had early knowledge of the new state house. He quietly arranged the purchase 18.5 adjoining acres from the agent of Jon Singleton Copley, who was living in England. After a decade of contention, the sale agreed to by Gardiner Greene on Copley's behalf was upheld, and the way was cleared for developing Beacon Hill. Otis and the Mt. Vernon Proprietors developed the area on Beacon Hill, which today runs between Beacon Street, Walnut Street, and Mt. Vernon St. through Louisburg Square to Pinckney St. Architect Charles Bulfinch created designs for the Proprietors which set out to make Beacon Hill spacious, with generous street-side setbacks, and large private gardens for residents. However, competition and high property values led the proprietors to set aside the Bulfinch plans for a more dense design conceived by Mather Willington. The Willington plan was based on an east / west street system, which as a secondary effect provided only limited access from Beacon Hill's racially heterogenous north face.